There is no question that cat lovers will do just about anything to keep their companion animals happy. In a small living space, though, it is not always easy to give your feline friends the space and toys they crave. 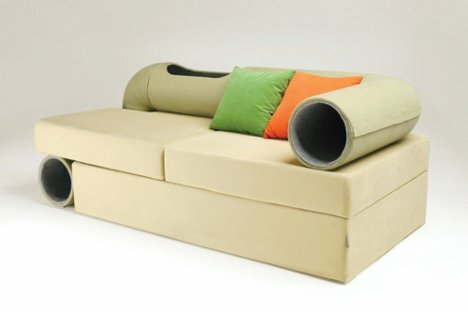 Designer Seungji Mun came up with this sofa in an effort to keep domestic kitties happy and active. 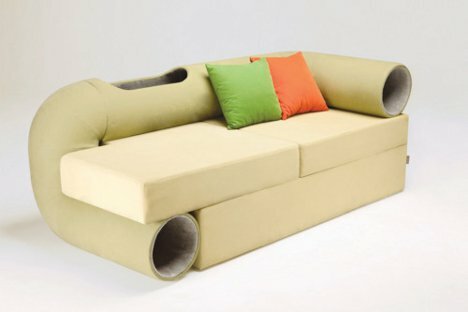 The sofa includes regular seats for humans, but it also incorporates a play tunnel for cats. The tunnel, which doubles as a backrest for human sitters, loops behind the human seating area, putting one entrance on the floor and one at the level of the seats. 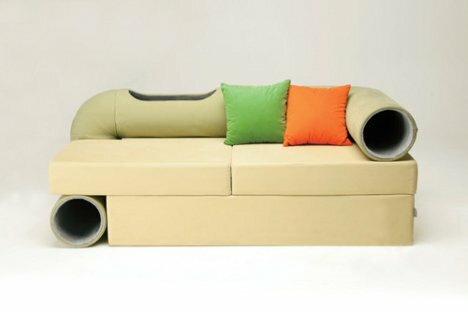 A peek-a-boo hole in the tunnel’s midsection allows you to interact with your cats as they hide and frolic in the tube. Mun’s design came as a reaction to the increasing number of companion animals in Korea. He noticed that furniture is a common ground, something that both the cats and the humans can utilize to their mutual enjoyment. Maybe the future of living with animals includes ridding the house of complicated cat-only and human-only zones in favor of shared furniture all around.